At about 9am on the 5th of August 2008, we refuelled, said our sad goodbyes to our cruising in company friends and headed off for the San Blas. First leg a whole 10 miles to Crawl Cay to so stop overnight before another 40 miles to Escudo de Veraguas, a small island 10 miles off the coast and an overnight 120nm to the Colon, San Blas area. It was beginning to look like we would have to stop a couple of days in Colon to get to Panama City and the Chinese embassy to get our visas for China. Having spent so many years travelling without visas, just getting our passports stamped on entry, we hadn't even thought of visas until we saw it on one of the Beijing Paralympics web sites. Frantic phone calls were made to Australia where we finally managed to get past the automated phone answering systems and actually talk to someone. Seems we need to go to the Chinese embassy in Panama City to get a visa. So, change of plan, it was now Wednesday and a tropical wave (weather pattern of rain, lightning but little wind) was due Thursday so we decided to stay at Escudo de Veraguas until Saturday, get to Colon Sunday pm, check in Monday and catch the bus to Panama City Tuesday. We arrived at Escudo de Veraguas at 15:30 Wednesday and it was already beginning to rain steadily. The anchorage did not afford brilliant protection so it was a bit rock and rolly from the ocean swells. For most of the night it was rain with several lots of lightning very close, we had Ednbal in full electrical shutdown again and just hoped we would not be hit. The lighting missed, only just, but it rained all the next day. As we were on the windward shore the stern of Ednbal was facing the shore less than 100m away. Ednbal was pitching so much that we did not want to risk trying to get the outboard onto the dingy so we decided to row ashore. 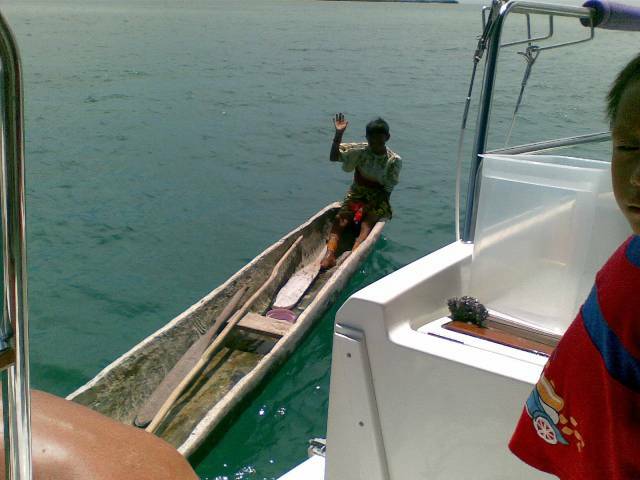 Bad move, just off shore a wave took us sideways, tipped me out and swamped the dingy. I couldn't stop laughing but Sasha was not too impressed especially since I lost my new cap that Randy had given me. We managed to pull the dingy up enough to drain out the water and most of the sand and went for a walk along the yellow sand beach. Nothing too memorable, a few old fishing shacks, palm frond roofs, built on short stilts, extremely basic. Oh yes and I found a hat, my new hat washed up on the beach almost 100m from the dingy. Next day it was much calmer and even a little sun so put the outboard on and went for a burn to the Southern end around Booby Cay. It was completely different so immediately relocated Ednbal to a sandy spot in 6m of water off Booby Cay. There, a number of tiny rock outcrop islands each completely covered in dense green tropical flora. Everywhere the rain forest came right down to the water, save a few very short yellow beaches. A very swift current ran through the rock islands, a least a few knots, over the coral outcrop bottom, perfect for drift snorkelling. What a wonderful day we spent. Alas all good things come to an end, we need to get underway for Colon for easy access to Panama City to sort out our China visas and to be in phone contact for an important friend's birthday on 10 August. If we leave about 3pm we should get into Colon about early afternoon Sunday. For a change, luck and the weather were with us, a 10kn beam breeze, a 1.5 to 2kn current with us and, although a lot of lightning visible, none too close. We were at the harbour entry of the Panama Canal by 8am and anchored in light rain by 9 before it absolutely bucketed down. During a break in the rain we went ashore to top up provisions for our planned 3 weeks in the San Blas, to be caught in another tropical downpour as we headed back to Ednbal. In good Colon fashion there was ample lighting all too close but we survived. By 7am next day we were on the $2.50 tour coach ride to Panama City. Somehow we ended up on the long route and it was 10:30 by the time we got to the Chinese visa office, after initially being dropped off at the wrong building by the taxi. Now the fun! No the consular, by way of her assistant, could not issue us a visa as she said it was against Panamanian law to issue visas to non residents. It was suggested we go to Australia or a Chinese consular in another country, Brazil, Costa Rica or Mexico IF they were permitted to issue to non residents of their countries. I tried all sorts of suggestions, ways means etc as the assistant staff understood and spoke excellent English. Finally at about 11:30 (half an hour before they closed for the day) it was time for the duo act, long face from me and tears from Sasha. At about the same time the consular herself came out to the waiting room and enquired with us so we gave the story first hand. Next thing the assistant gave us visa application forms (we had all the necessary paperwork with us) and said the consular would issue our visa. All we had to do was shell out $180 and come back at 4pm to pick them up, unbelievable! 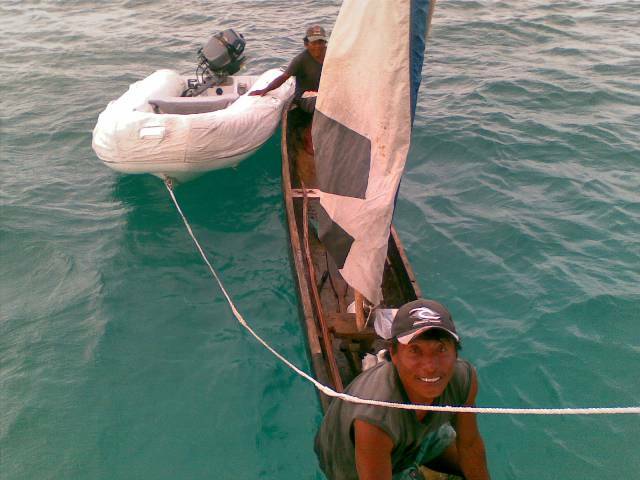 Given our experiences with Colon, we wanted to stay as short a time as possible, we left at 2am to get us into Porvenir, San Blas, 75nm, by afternoon. We managed to dodge the myriad of ships moving and anchored in the canal area and were soon motor sailing with only 5 or 6kn of wind, a nice comfortable trip with no lightning too close. It was also a time for Panama visa extension, a month by month thing, $10 per person plus, in Porvenir, $20 for the officer, no receipt. From Porvenir it was a short 12nm sail, well motor with no wind on a mirror sea, to our favourite spot, the East Hollandes Cays where we anchored about the spot we spent some time in last year. What a day, clear and warm, ideal for snorkelling over the coral followed by sundowners and a Sasha special pepper crab dinner. We had been putting the word out to every local Kuna Indian fisherman we saw in their dugout canoes, "Cuga", Kuna for crab. 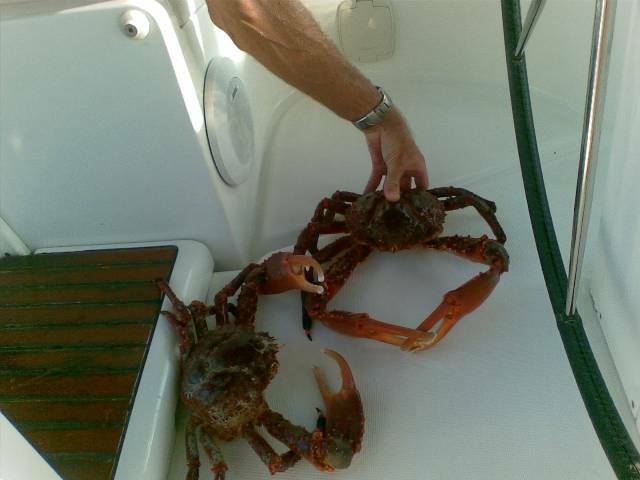 A few hours after we anchored a guy came alongside with two beautiful big, very much alive, crabs enough for two meals! A couple of days later it was my birthday, Champaign BBQ breakfast, snorkelling over coral with all sorts of fish, alone in a virtual lake, calm warm water about a mile square surrounded by palm covered islands and barrier reef, chilli crab for dinner, paradise. A couple of days were spent just enjoying, swimming, a few vessel maintenance jobs, roaring around in the dingy to various coral reefs for snorkelling, beers at lunch, sundowners and of course Sasha's gourmet cooking. On Sunday morning we motored over to the East Hollandes to an anchorage known as the swimming pool where there is a weekly get together "pot luck" each Sunday evening on Bbq Island. Sasha made mini pizzas, her own dough and all; they lasted about 5 minutes on the table. It was nice to meet and chat with other cruisers, over 20 people were there but the down side is once you get back to your boat the tranquillity is interrupted by people running generators. Next morning we headed to a group of islands, a few miles closer to the mainland, known as the Coco Banderas and anchored between two palm islands about 300m apart. Gorgeous snorkelling of the reef right off the back of Ednbal and more crabs supplied! However we had a small disaster, the 120 Amp battery charger part of our 2.5Kw charger/inverter died, never to go again. It was just a few weeks out of warranty. There were thoughts of returning to Colon early but we wanted so much to spend a couple of weeks in the San Blas. We dragged out the small spare charger that put out about 15 Amps and decided to move to a different island each day to use the main engine alternator to keep the batteries charged. In the mean time we contacted the manufacturer, Victron in Holland and they offered to send all the way to Panama, at no cost, a new one, unbelievable. So, we moved all over the place, not many islands in the San Blas we did not visit over the next two weeks, during which there were a few events of note. First up we ran out of gas, propane. While it is the main cooking fuel of the towns’ people and there is plenty available, the fittings on the gas bottles are different. I had bought a spare bull nose fitting with just a short hose on the end in Cartagena to be able to decant the liquid from another bottle if need be. Now all I had to do was get a local fitting, put on the end of the hose and hey presto. Unfortunately the only fittings I could find had a regulator built in so no go. Well we were running the generator more for batteries; we have a large electric fry pan come bbq, an electric coffee pot and a microwave so it was to be electric cooking until we returned to Colon where our bottles could be filled. 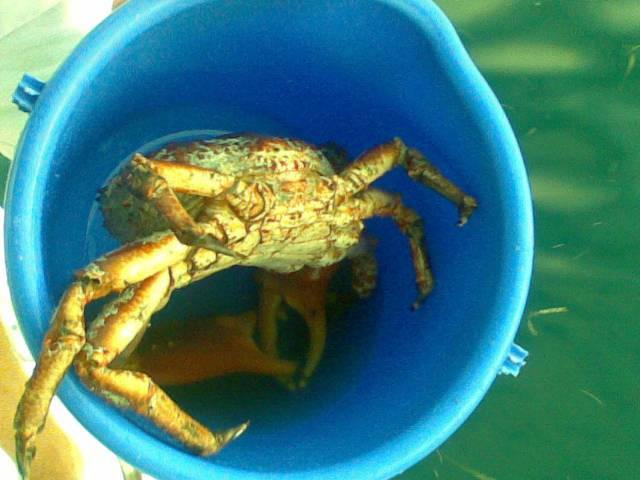 Bit of a challenge to cook the big crabs and lobster but the electric fry pan full to the brim with water did the trick. Next was the extension of our cruising permit. In Bocas we were issued with a 3 month cruising permit that allowed Ednbal to remain in Panamanian waters for up to 3 months. When we checked in with the harbour master for the San Blas, at Porvenir, he told us to see him before we left for Colon to fly out to Beijing so he could extend our permit that otherwise would expire before we returned. So, on Friday morning we went for our extension. Immediately he exclaimed "problemo, mucho problemo". Apparently there had been a change of rules; rules here can change week by week! There were to be no more cruising permit extensions. His solution was quite simple, sail to a neighbouring country such as Columbia or Costa Rica, check in then out, return to San Blas and he could issue a new cruising permit. Luckily there was another cruising couple who spoke perfect Spanish so there an extended discussion. The port captain wanted to help, come back and see him at 2 o’clock. We returned and as usual for a small additional fee anything was possible. After much aggravation, we were issued with a new cruising permit valid for a further 3 months. After leaving Porvenir we had a short trip to the West Lemon Cays. The anchorage is in between 3 islands and we were the only ones there, lovely. After sundowners and a crab feast dinner we went to bed as usual. I woke and thought I heard an unusual noise outside, it was 2:15. I took a look on the still calm night but saw nothing so back to sleep. Next Sasha woke to the sound of something banging on the back of our boat, it was just before 3. The dingy, tied by ropes and locked with plastic coated stainless steel wire to the gunwale Ednbal was banging up against the stern. Someone had cut the ropes and attempted to steal it. They had undone the outboard but it too was locked, to the dingy. We shone our spotlight and could see two people paddling a couple of hundred metres away. Our fuel tank with fuel line, anchor, safety flares and Sasha's sandals not locked, were all missing from the dingy but we still had our dingy and outboard. Not a nice experience. Next morning a couple from the closest island paddled over to us in their ulu. They seemed to know what had happened and were quite apologetic. Every community has its trouble makers, apparently there stole items from the island home too. However they had left our fuel tank on the island so it was returned to us. Later in the day the lady from the island came over with her grandson to visit us. Sasha chatted with her, in limited Spanish and sign language. We gave them a few things and a little money that seemed to be much appreciated. From then on we lifted and locked the outboard to the storage bracket on Ednbal as well as lifting the dingy to its storage position every night. Doesn't take that long, 10 minutes for both of us. A few days were spent at different anchorages all with much the same theme, close to coral reefs for swimming and snorkelling, clear water and away from most of the others, mostly Americans that anchor very close to one another. The time to head towards Colon and off to China for the Paralympics drew closer and as we wanted to stop in at a couple of spots on the way we set sail from the West Lemon group of islands 1st September. Our guide made mention of a few possibilities, we settled on Green Turtle Bay, where there was supposed to be a new marina and a reasonably protected anchorage. We sailed into the bay just as a squall was over us, a nice wash for the boat bit not so easy for anchoring between two coral reefs. The marina had been pens (slips) had been all but finished, obviously some years before, but were not in use. Later we found out that there were environmental issues, no water flow resulting in stagnant water and the marina had not been allowed to operate. Next stop, after a comfortable day sail when we also caught a lovely Cero Mackerel, was Portobello to catch up with a French couple, Colette and Michael, who we had met last year. We were a little apprehensive as friends Lulu and Gigi had their dingy stolen here some months before. While there dingy and outboard were retrieved, the police shot one of the thieves in the process. A river empties into the bay so the water is not exactly inviting, leisurely swimming was not an option! We spent a lovely afternoon with Colette and Michael who had recently bought the house they had been renting and were in the middle of extensive renovations. Another easy day sail, well mainly motoring with no wind, had us in the main shipping channel of Colon, the Eastern end of the Panama Canal. Again we were greeted by a squall that hit 35kns with driving rain as we were dodged the myriad of anchored ships. Sasha, as a good decky, was up the bow in heavy rain to drop the anchor in the infamous Flats anchorage (where we had been hit by lightning last year) close to friends Richard and Jan on Scorpio. We had a beautiful catch up dinner on board Scorpio and got the low down on the happenings in Bocas since we had left. Tentative plans were made to catch up again upon our return from China and Oz, possibly in San Blas or Cartagena to sail to Northern Venezuela. Next day it off to Shelter Bay marina to settle Ednbal in for her one month stay while we went away. As usual, with an internet connection, a million things to do and organise. High on the list was ensuring we would be at the airport on time. No big deal I hear you say. Well not quite, our flight departure was scheduled for 08:00 on 8th September, a Monday morning. Need to be there about 6 and travel time Colon to Panama City is about 2 hours, so leave about 4. Too early for bus so go Sunday and stay in a hotel. Tried 4 hotels close to the airport, all full. Hmm, maybe taxi from Colon, main problem was to find one sufficiently reliable to pick us up at 4am, not so easy! Eventually we "contracted" Stanley, an English speaking taxi driver who advertised in the local cruising magazine, to pick us up. I rang him 3 times, including 2am Monday morning to make sure he would be on time to pick us up. It worked, we got to Panama City way to early but were all set ready to roll, Paralympics China here we come.